The Leica R4 family of Leica 35mm SLR cameras was launched in 1980. The initial design was a joint venture based on Leitz's co-operation agreement of 1972 with Minolta, whose own version was launched in 1977 (Minolta XD series). The subsequent models introduced improved electronic features and TTL flash metering. The R4 has a Leitz developed mirror box, metering, and body design making the camera quite distinct. 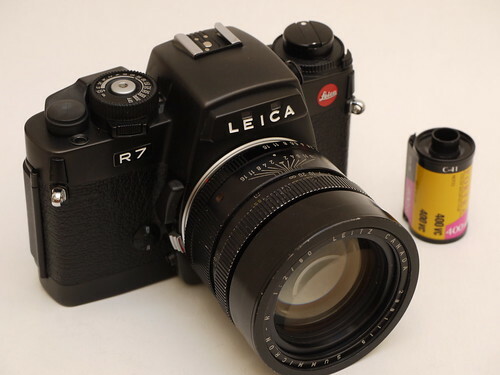 The same body and chassis were used for all subsequent Leica R models through to the R7. Like the trend setting Olympus OM-1, the R4 was much smaller and lighter than its predecessors. Also the design was sleek and rounded in contrast with the starkly angular appearance of the R3. Following on from the transitional R3, the R4 and its successors led the way to a considerably expanded Leica R system including many new lenses. The series was marketed from 1980 to 1996, with the original R4 being the longest running version from 1980 to 1987. The R7 was the last in the series, replaced in 1996 by the R8 which was a completely new in house development. In 1980 Leitz introduced the camera as Leica R4 MOT Electronic to emphasize the technology and features. However, since no motor was built in, the term was not well received and from 1981 it was simply called Leica R4. A chrome version was launched the following year. 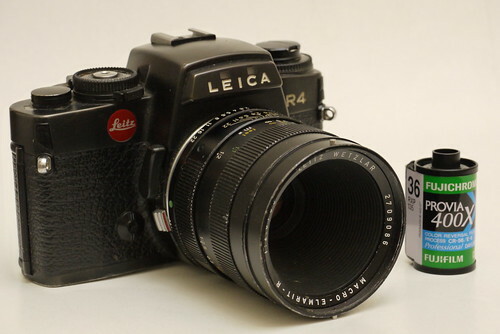 A slightly modified model, the Leica R4s, with fewer automatic modes was made available in 1983 at a reduced price in order to help increase sales. The final version Leica R4s-2 was launched in 1985 with improved controls (called the R4s-P in North America). A limited edition Leica R4 in gold and brown skin appeared in 1984. Focussing screens are interchangable, all with a central 7mm ring indicating the selective metering area. There is a built-in viewfinder blind but dioptre correction is by separate eyepiece. Manual - whole stops from 1s to 1/1000s, X flash sync 1/100s, emergency mechanical (no power) 1/100s, B "bulb". Automatic - stepless from 8s to 1/1000s. A single light cell is mounted in the base towards the front pointing back at the film plane. The main mirror is semi-silvered and light passing through is reflected by a large secondary mirror onto the sensor. A small condensing lens is moved mechanically to effect the change from selective to full field metering (this can be felt quite distinctly when moving the selector between modes "a" and "A"). The R4s was a lower priced model with reduced features, lacking P and T modes. MOD 2 was a later release with revised controls, principally a much improved exposure compensation control. For the first time, a Leica reflex camera was offered from the outset with the option of a winder or motor drive. The winder transports at 2fps and the bulkier and heavier motor drive at selectable 2fps or 4fps. Both can be fitted with the handgrip, both also supply power to the camera providing an alternative power supply for the camera itself. Both also use separate battery carriers so it is possible to carry a spare carrier and change power sources almost instantly. The winder was developed to be particularly silent with rubber O ring drive from the motor. The motor drive has all metal gears. Neither offers film rewind or end of film sensor. Leica recommended using only 36 exposure rolls as the camera would stop at exposure 36, preventing film tear out. Early models of the R4 suffered electronic failures (serial numbers below 1600000, made in Portugal). However those still working have either been repaired or are unlikely to give problems. Foam light seals on the camera back may degrade causing light leaks around the film identification window. 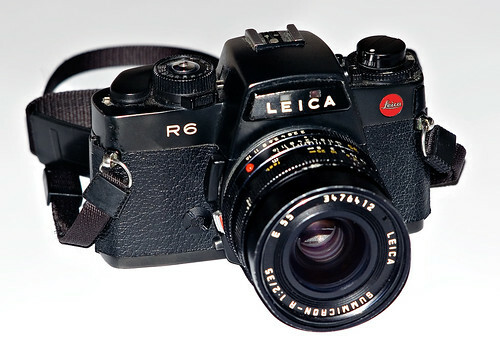 The Leica R5 was launched in 1987 (and R5 chrome the following year). It introduced Program shift and, much more importantly, TTL flash exposure. Shutter speed was also increased to 1/2000s and extended to 16s in automatic modes. The viewfinder included built in dioptric correction and back lighting. In P Program mode the shutter speed dial is used to bias towards longer or shorter shutter speeds (where possible). A small "p" at 1/30s indicates the normal setting. TTL flash is measured by a second light sensor beside the main sensor, and always measures full field regardless of mode. The RE, like the R4s, was a lower cost version lacking P and T modes. Production of the RE was in Solms, Germany, where all future R cameras would be assembled (including some later R5 cameras), although the factory in Portugal continued to manufacture sub-assemblies and accessories. A minor revision was from mechanically connected to electrically connected hand-grip. Both hand-grip and winder / motor drive had small changes and were not cross-compatible, although any winder / motor drive would fit on any camera of the R4–R7 series. The Leica R6 (in either black or chrome), was launched in 1988. It is a very different camera, developed and manufactured in Solms. Its operation is entirely mechanical with electronics for light measurement only. Exposure is manual only, the selector merely switches between selective and full-field measurement. Aimed at professional photographers, the R6 was significantly more expensive than the R5. Automatic TTL flash exposure is provided, as on the R5. The R6.2 has an improved shutter with 1/2000s top speed. It continued to be sold alongside the R7 and even the R8 for a short time. Information display in the viewfinder is simplified with a three-segment LED beneath the main view indicating under / correct / over exposure (similar to the M6). Shutter speed and aperture window are also displayed below the main view. Display backlighting is provided. Manual - whole stops from 1s to 1/1000s (R 6.2 1s - 1/2000s), X flash sync 1/100s, B "bulb"
The R7 was extensively reworked and Leica's first microprocessor controlled camera. This entailed additional circuitry in the base increasing the height of the camera requiring a new taller grip for the winder or motor drive. Automatic DX film sensitivity setting is provided with manual override. Shutter, light metering, and exposure modes are unchanged from the R5. Information display was revised and the selected (or computed) shutter speed is shown digitally in the viewfinder, together with the selected exposure mode and aperture display window. In manual mode the vertical display shows a scale of +2 to −2 EV with centre correct exposure, making setting manual exposure much easier. In shutter priority and program modes the vertical display shows computed aperture setting, meaning that in program mode the camera displays both computed shutter and aperture settings. The main enhancement from previous models is fully automatic flash control when using SCA 300 / 500 units. In Program mode the camera selects between normal exposure and, in low light, flash exposure. The flash unit can remain switched on allowing the camera to select select between ambient light and flash exposure. Automatic fill-in flash is also available. Like the R3, the R4 and variants were made in Leica's factory at Villa Nova, Portugal. The R5 was also made in Portugal for most of its production. 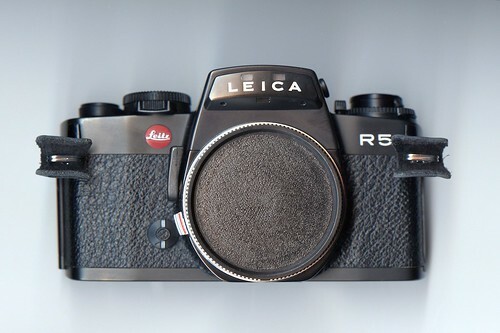 Th R6 and R6.2 were made in Leica's newly set up factory in Solms, Germany. RE final assembly was also in Solms, although major sub-assemblies continued to be made in Portugal. Late R5 final assembly was moved to Solms and all R7 final assembly took place there also. Cameras made in Portugal have a red "Leitz" emblem on the shutter release / winder side of the camera, with the model number on the opposite side. German made or assembled cameras have a red emblem reading "Leica" moved to the opposite side, i.e. the rewind / film speed side, with the model number on the shutter release / winder side. Handbook of the Leica System. Leitz, 1984. A rotatable 3D photo of a Leica R5 can be found at www.simpel3d.dk. This page was last edited on 30 January 2017, at 02:50.